The watermark is not a part of the actual print. When Gallery 1988 invited me to be a part of their Bad Robot show I just couldn't say no. The hard part was trying decide what to do. So many great films and TV shows have come out of Bad Robot and the mind of J.J. Abrams it was hard to choose. 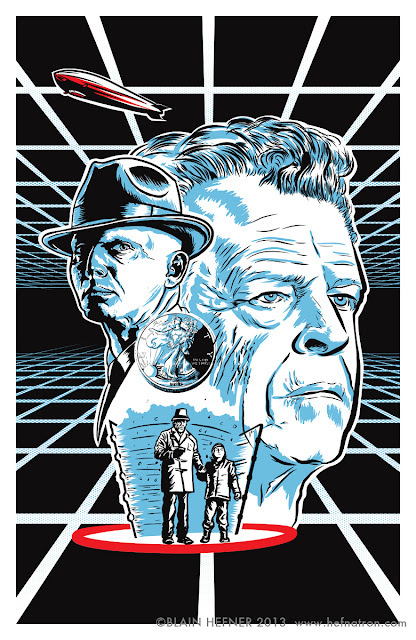 I finally decided to do a limited screen print based on one of my favorite episodes of "Fringe" called "Peter." It's a throwback episode that takes place mostly in 1985 and even the opening credits were a call back to '80s sci-fi shows. The print is an edition of 20, 13" x 20", $30 each (unframed) and the 1/20 print framed for $60. Rural Rooster printing in Austin did an excellent job with the prints for the show. They're great guys to work with and very affordable. The show opens tonight at G1988's West gallery location. If you're in LA, go check it out — looks like it'll be an amazing show. If not, all remaining art will be available online this weekend.